Sunday was another epic game for the Broncos. Broncos quarterback Peyton Manning, who broke Tom Brady’s single-season touchdown record last week, took down another record on Sunday against the Oakland Raiders. Manning broke Drew Brees’ single-season passing yards record, throwing for 266 yards in the first half. Brees set the previous record of 5,476 yards back in 2011. But that wasn’t all. Manning also padded his touchdown record with four scoring tosses, putting him at 55 for the season. 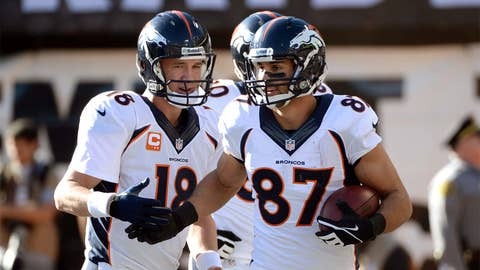 But football is a team game and the Broncos accomplished an impressive feat, as their 31 first-half points pushed them to 603 points in 2013, which passes the 2007 New England Patriots (589) for the most in a single season. What a season it’s been for Denver.